Vermont’s historic downtowns and village centers are widely recognized as a key part of the state’s allure for visitors from around the globe. Travelers explore tree-lined streets graced by restored and repurposed buildings of all kinds. They discover locally-owned retail businesses with unique specialty goods, casual and fine dining featuring fresh, local, and award winning food, wines and brews, and arts, culture and history attractions that feed the soul. Vermont downtowns are a centerpiece of community life, and your guests will be welcomed with warmth and enthusiasm. Burlington’s vibrant town center has two not-to-be missed features. Church Street Marketplace is a pedestrian mall that is home to street performers, festivals, three-season outdoor dining, and great shopping. Burlington’s downtown waterfront connects pedestrians to the shore of majestic Lake Champlain with one-of-a-kind views and dining, tour boats, parks, bike and boat rentals, scooter tours and more. A visit to northern Vermont isn’t complete without exploring the fastest-growing downtown in the state. You can eat shop and play in this authentic Vermont village where recreation is king. Enjoy THREE local breweries, delicious farm-to-table restaurants, unique B&B accommodations, arts and outdoor events, the four-season Lamoille Valley Rail Trail and several parks provide ample opportunities to experience nature right from the steps of this historic walkable downtown. Fresh by Nature. Newport believes that the best way to a town’s heart is through your stomach – and their Farm to Plate restaurants and Tasting Center make that happen. Enjoy a walkable town with great local shopping, cruises on Lake Memphremagog and watercraft rentals for the adventuresome. Festival, summer concerts and living history events commemorating the site of the Northern-most land action of the Civil War. St. Albans boasts locally owned shops and dining destinations for “time on own” or planned tour stop. Drop off/parking arrange at 802-524-1500, Downtown Programs Dept. National Geographic Adventure’s “#1 Small Town for Adventure.” Discover beautiful Victorian architecture and a walking tour that exposes the town’s layers of history. Public library and gallery, St. Johnsbury Athenaeum, a National Historic Landmark, includes monumental paintings by Albert Bierstadt. Explore Fairbanks Museum & Planetarium and Catamount Arts. Downtown has dining and boutique shopping including Northeast Kingdom Artisans Guild, a Vermont State Craft Center. Stowe is world famous for its year round outdoor activities and adventures. From canoeing to zip-lines, and walking to soaring, practically all recreational pursuits await Stowe visitors. The historic village and surrounding country roads host a thriving arts community with galleries, clubs, performing arts and fine crafts. Shops feature clothing, homewares, and artisan-made goods, while restaurants and brew-pubs earn nation accolades. Elegant re-purposed mills and Victorian-era shops offer a variety of dining experiences in unique specialty restaurants – from sought-after Asian cuisine to traditional, down-home Italian dinners. Galleries, craft brews, nightlife for the young-at-heart and a Riverwalk along the falls that once powered the town’s mills make this a great stop for groups in search of something out of the ordinary. Barre is home to art and history. Known internationally as the Granite Center of the World, downtown Barre and the famous Hope Cemetery feature memorable large-scale and intimate sculptures. Enjoy exhibits at the Vermont History Center and shows at Studio Place Arts and the Barre Opera House that push the envelope with new work in the visual and performing arts. Granite from the He(art) of Vermont (http://bit.ly/1BMwKAI) is a great tour of what makes Barre and the surrounding region so special. On the Connecticut River Byway, Bradford’s historic downtown offers a diverse range of activities. Take in a play at the Old Church Theater, visit our Bradford Historical Museum or the Falls at Boch Park, stop for a meal or partake in locally grown, organic homemade products while. Boat, canoe and kayak on the Connecticut River, or go hiking at Wright’s Mountain. A trip between two points along Vermont’s western north-south corridor should include a leisurely stop in Brandon. Visitors will find gifts that express Vermont’s stunning art and crafts, wearables and collectables, and an eclectic variety of antique shops, dining establishments, galleries and homewares stores. For the non-shopper, there’s Civil War era history at the Brandon History Museum and Welcome Center. Flanked by the Green Mountains, Bristol’s compact boasts small unique shops, delicious dining and great local brews. The handsome town green and gazebo host town events throughout the year. Equally notable is a plant nursery with beautiful demonstration gardens, arguably the best ice cream you’ll ever enjoy, and a gracious New England bed & breakfast noted for its restaurant and grounds. Set aside time for Middlebury. Museums include the Middlebury College’s Art Museum, Henry Sheldon Museum of Vermont History, Vermont Folklife Center and National Museum of the Morgan Horse. The historic town center straddles scenic views of the falls at Otter Creek, and shops include bookstores, collectables, clothing, and destination art and craft galleries. More than four restaurants offer riverside dining featuring the best of local foods, beer, wine and spirits. Factory tours, demonstrations and tastings are available at Danforth Pewter, Maple Landmark Woodcraft and Woodchuck Cider – and there’s more! Montpelier – America’s Small Town Capital – is the smallest in the nation, and one of the most picturesque. The fully restored 19th century State House welcomes visitors from all over the world. Next door the Vermont History Museum chronicles Vermont’s history. Numerous restaurants, boutique shops and bookstores means that browsing here can take hours. Motorcoach drop off /parking: Drop off at lower end of State Street. Parking behind the Capitol Plaza Hotel. Someone who adores Poultney describes it as a quintessential New England village with its white steepled churches an expansive town green and a retro diner that takes you back to the 1950s, with the best comfort food ever. Combine this with the a town walking tour that unearths centuries of captivating history, and you’ll come out even. Perched on a hill, looking much as it did in the 1930s, this is the birthplace and boyhood home of Calvin Coolidge, the 30th President of the United States. This National Historic Landmark village with the family homes, community church, cheese-making factory, schoolhouse, general store, and Summer White House has been carefully preserved, many with original interiors. Today much of it is preserved as the President Calvin Coolidge Historic Site where with interactive exhibits, revolving exhibitions and friendly tour guides staffing the historic exhibits. Just off 1-89 at the cross-roads of several important routes, Randolph is the geographic center of the state and is the cultural center of the region. The downtown offers shops, eateries and the Chandler Center for the Arts, the White River Craft Center and the Randolph Playhouse, Vermont’s oldest movie theater. Motorcoach parking: Prince Street parking area. Waterbury is another town providing visitors with the unexpected. Park the bus at the Green Mountain Coffee Roasters Welcome Center, and set the guests free for discovery. Excellent restaurants, local beers have earned this town destination status, and there’s a wine bar, galleries, studios and books too. Back on the bus, Ben &Jerry’s and Cold Hollow Cider Mill are just up the road. Woodstock is a gracious old town with towering shade trees and well-maintained historic homes and businesses. Shopping and dining provide memorable experiences, while the only National Historic Park to interpret land conservation, a working 1890s dairy farm and museum, and a museum of Woodstock history are within a short walk from the town’s center. Rutland hosts a weekly outdoor marketplace with food, swaps, art and crafts. For a shorter “explore on your own” Vergennes offers restaurants, galleries and shopping. Motorcoach parking: Ferrisburgh Park and Ride. White River Junction, home to a growing arts community and features an independent film festival every June. Motorcoach parking: Municipal lot behind the American Legion building. With tree-lined streets, marble sidewalks and quintessential New England architecture, Arlington welcomes visitors to kick back and take in the sights and activities at a relaxing pace. Country inns welcome visitors for meals and lodging. Shops include provisions, cheese maple and syrup. Nearby covered bridges and the famous Battenkill trout stream attract visitors, and for a great view, there’s the Equinox Mountain Skyline Drive. Bellows Falls has rightly earned a reputation as an arts hub and home to preserved and re-purposed architecture. As an early railroad town with a canal system, bridges, and water-powered mills, Bellows Falls today includes three districts listed on the national Register of Historic Places. Beautifully restored and re-purposed homes and commercial buildings provide the backdrop to a lively arts community and downtown, including restaurants, shops and antiques. Nearby residential areas include Victorian-era homes known as “painted ladies:’ Motorcoach parking: Center parking lot at Amtrak Station/Depot Street in Rockingham. Restrooms and information available. Founded in 1761, Bennington attracts visitors for history, art, craft, theater, music, dining, and festivals. The Bennington Museum exhibits paintings by Grandma Moses, and some of New England’s best historic furniture. Pottery has been produced in this town for more than 200 years, and Bennington Potters invites visitors on factory tours of their craft production history and methods. The Old First Church and the Bennington Battle monument provide Colonial-era history. Motorcoach drop off /parking: Drop off on School Street in designated area and park adjacent lot and/or on Depot Street. Visit the Bennington Welcome Center on Rte. 279 at Rte. 7 and Rte. 9 interchange. Welcome to “the one and only” Brattleboro – there’s no other town quite like it! Situated along the confluence of the Connecticut and West rivers, Brattleboro boasts a unique collection of cultural venues, art and craft galleries, restaurants and shopping. Annual festivals include “The Strolling of the Heifers”, the Southern Vermont Dance Fest and the Brattleboro Literary Festival. Motorcoach drop off/parking: Drop off at Brattleboro Transportation Center on Flat Street. Park at the far end of Elm Street lot. Nestled in the mountains, Grafton is one of New England’s prettiest villages. Many of its beautiful and historic buildings have been restored by its residents and the Windham Foundation, so today’s town looks much as it did years ago. Grafton’s uniqueness comes from being a real town – not a museum like re- creation. Walk the streets, visit museums, shops and galleries for a day well-spent. Save a full day for Manchester. There’s plenty of sophisticated outlet shopping, one of New England’s very best bookstores, great restaurants for every palate, and many galleries featuring fine art and contemporary craft. Museums range from the American Museum of Fly Fishing to the Southern Vermont Arts Center featuring art and sculpture. Manchester Music Festival performances are not to be missed, and regional theater at the Dorset Theater Festival and Weston Playhouse bring national talent to summer productions. Springfield’s historic attractions include the 1910 Hartness Equatorial Turret Telescope, one of the first tracking telescopes in America; the late 18th century Eureka Schoolhouse; and the Baltimore Covered Bridge. Downtown is home to The Gallery at the Vault, one of only six Vermont State Craft Centers, and many fine local restaurants. Annual events include the Windsor County Agricultural Fair and the Stellafane Amateur Telescope Makers Convention. Motorcoach parking: Clinton Street and Main Street parking lots. Wilmington welcomes you. “Explore our mountains; be entertained at our festivals and celebrations; visit our specialty shops, craft studios and galleries; eat at our famous, family-owned restaurants; be welcomed at our village inns and lodges. 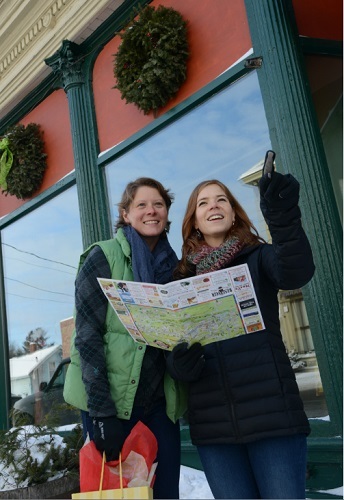 Experience our Vermont, the place we love … Wilmington in the Mountains.” Historic Walking Tour Map, Group Tour accommodations and easy bus access and parking in new expanded lot. History, outdoor recreation, a quaint downtown, unique shopping experiences and a record of innovation that spans centuries, are among some of the attractions that make Windsor a great destination for a visit. Enjoy Windsor’s “Artisan Park” and Main Street shops, and explore unique dining opportunities. Windsor’s self-guided walking tour features over 40 historic structures that connect to local and national history.